Superb indoor or outdoor variety! Masses of multi headed pure white flowers with heady fragrance. Flower in as little as 6 weeks from planting when grown indoors! Plant Nov for Christmas. Gorgeous sweet scent that will fill the air. A superb indoor or outdoor variety that produces a mass of very sweetly scented, multi-headed flowers. 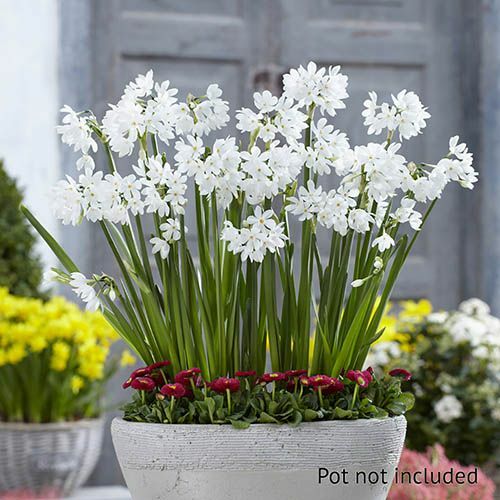 It will reliably flower 6-8 weeks from planting indoors so makes a wonderful gift! Height 40cm (16). Plant close toegther in pots for maximum impact. Why not grow some for flowers at Christmas?? Supplied as a pack of 10 bulbs, ready for planting. Size 14/15.